Whether you are a local resident who wants to rediscover his or her hometown or someone who is planning to travel to Philadelphia and do some sightseeing on your vacation, I hope that you find this series useful and enjoyable. Be sure to check the photos found on the right side of the page. When I drive into the city, I prefer to park in Old City as opposed to mid-town. Parking in Old City is closer to I-95 which, for many, is the most direct route into and out of the city. There is less traffic and the rates are much better. I like to park at the lot bordered by Front and 2nd Streets, Walnut Street and Gatzmer Streets. It is right behind the old Bookbinders Restaurant, and next to the Welcome Park. Here's a map to help. If you get there before 10:00 a.m. you can park all day for less than $10.00, a real bargain by big city standards. 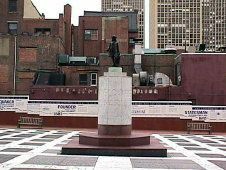 As you exit the parking garage, you find yourself in "Welcome Park," the site of the Slate Roof House where in 1701 William Penn wrote his famous "Charter of Privileges," the framework for the government of Pennsylvania. Today there is a small, but nice, park where you can sit for a few minutes before you start your walk. The street visible from the park is 2nd Street. As you face the street, the building to your right, next to the parking garage is the Thomas Bond House, a restored 18th century house with 19th century alterations. This house now is a popular bed and breakfast inn. Across the street to the left is the City Tavern Restaurant, a reconstruction of Revolutionary America's finest tavern. Today the restaurant which is open for lunch and dinner. The staff dresses in colonial dress, so you can get the feel for how it felt to eat back in revolutionary times. Make a left on 2nd Street and walk to the corner. When you reach the corner of 2nd and Walnut, you're going to make a right and head up town, but first, take a look to your left right there at the corner and you'll see the former Bookbinders Restaurant, once one of Philadelphia's most famous restaurants, known world-wide for its seafood and snapper soup. It is currently under renovation and scheduled for a re-opening in 2004. NEXT PAGE - Walnut Street and the First Bank of the USA click for more images Welcome Park Photo by John Fischer Part 1 - Welcome Park to the First Bank of the USA Whether you are a local resident who wants to rediscover his or her hometown or someone who is planning to travel to Philadelphia and do some sightseeing on your vacation, I hope that you find this series useful and enjoyable. Be sure to check the photos found on the right side of the page. As you begin your walk up Walnut Street you will see old on your right and new on your left. On your right you'll see the Philadelphia Exchange. Opened in 1834 this building housed the Philadelphia Merchants Exchange for many years. There is currently restoration being completed. The building is not open to the public; it will be occupied as administrative offices by the Federal Park Service. On your left you will see the a modern restaurant, the Ritz Five movie theater (which shows mostly art films), and older buildings occupied as offices and homes. When you reach the corner of Walnut and 3rd, make a right. We're going to make a short detour to stop in the former Visitor Center of the Independence National Historical Park. Take a look at the 130-foot bell tower which houses the Bicentennial Bell, the British people's bicentennial gift to The United States. The Visitor Center has moved to Independence National Historical Park, so you'll probably find the building closed. Directly across the street from the old Visitor center is the First Bank of the United States. This was the home of the government's bank from 1797 to 1811, and the oldest bank building in the United States. It is restored on the exterior but is not open to the public. The interior is open only for specially scheduled events. Head back up 3rd Street to Walnut Street where we will make a right and continue our walk in Part II of "A Walking Tour of Downtown Philadelphia." First Bank of the United States Photo by John Fischer Part 1 - Welcome Park to the First Bank of the USA As you begin your walk up Walnut Street you will see old on your right and new on your left. On your right you'll see the Philadelphia Exchange. Opened in 1834 this building housed the Philadelphia Merchants Exchange for many years. There is currently restoration being completed. The building is not open to the public; it will be occupied as administrative offices by the Federal Park Service.